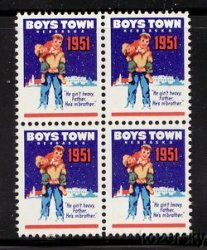 Boys Town 22.4, 1951 Boys Town Charity Seals, block of 4, F, MNH. The seal design was similar to the 1950 seals, but dated 1951. Boy with a smaller boy on his back. "He Ain't Heavy Father He's M" Brother." Boys Town, Nebraska, at bottom of seal. Multi-colored, seal size: 17x23, perf: 121/2x12. Straight edge seals available at 1/2 price.